I love reading about how the other half lives and this book has that in spades! High stakes auto racing, private jets, aristocratic characters and loads of money. 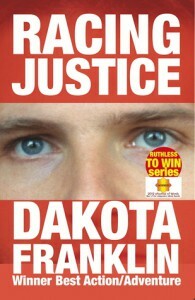 Racing Justice is a look into the life of the upper crust and a really good legal caper to boot. I’m always trying to categorize the books I read. This would probably be called a legal thriller but legal caper describes it better to me. It centers around the 24 Hours at Le Mans car race that attracts the most elite of the world’s jet set. There are people here who will do anything to win including kidnapping the other team’s drivers. Needless to say, this doesn’t go down well with the team who’s driver was kidnapped or with the ex-boyfriend of the driver, who happened to be female. This ex-boyfriend, Simon Aron, is a very rich and smart young lawyer. He and his friends set out to punish the offender and I find the twists and turns enormously engaging. It takes the reader all over the world and throws around money like water. If rich people offend you, don’t read this. I personally loved it. There are a couple of small flaws that keep it from getting 5 stars. There are way too many characters. A person almost needs to keep a roster to remember who is who. The other flaw was that the author seems to assume that we are all more familiar with the racing world than most of us probably are. This was true especially at the beginning of the book where I was a little baffled at times but as the book continued we actually learn a lot about how it all function so that was interesting. I actually see this as a book that I might pull out and read again. The author provided this book in exchange for an honest review.